A vessel's waterline length (abbreviated to LWL) is the length of a ship or boat at the level where it sits in the water. The LWL will be shorter than the length of the boat overall (LOA) as most boats have bows and stern and stern protrusions that make the LOA greater than the LWL. As a ship becomes more loaded, it will sit lower in the water and its ambient waterline length may change; but the registered LWL it is measured from a default load condition. This measure is significant in determining a several of a vessel's properties, such as how much water it displaces, where the bow and stern waves occur, hull speed, amount of bottom-paint needed, etc. Traditionally, a stripe called the "boot top" is painted around the hull just above the waterline. In sailing boats, longer waterline length will usually enable a greater maximum speed, because it allows greater sail area, without increasing beam or draft. 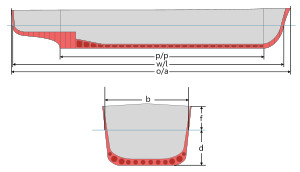 Greater beam and draft produces a larger wetted surface, thereby causing higher hull drag. A boat's maximum speed, also known as theoretical hull speed, can be calculated using the formula: Vmax (in knots) = square root of LWL (in feet) x 1.34.